Posted in: General Market Thoughts. Tagged: $SPX, $VIX, $VXO. No clarity. Was hoping that by today there would be some kind of sign that markets were getting ready to roll over but nothing so far. Still expecting this to happen but with CSCO’s earnings be received so well then it doesn’t appear that much will change tomorrow. The $SPX/$VXO & $SPX/$VIX charts I’m following are getting more and more stretched to the down side and the market should react to the near absence of market fear, but one never knows. Maybe this time will be different and the markets will just rally on. Time will tell. I remain in cash and cannot commit fresh money to the market at this time because I need the safety of a pull back in order to do that. Until there is a pull back, I’m just going to watch from the cheap seats. Posted in: Uncategorized. Tagged: $NYSI, $SPX, $VXO. Watch this chart as it has a fairly good predictive record. Once the blue line, which is the 5EMA of the $VXO, tags and/or drops below 15, then something is probably going to happen in the markets and if the past is of any value in divining the future then what happens is not going to be fun for the bulls. The red vertical lines mark the previous times the 5EMA has tagged or dropped below 15 and show that some turnings lag by several days while other times market reaction was immediate. You can easily set up a chart like this using $VIX. I have one that I use but I just prefer the $VXO for this even though it is now the volatility index for the S&P 100. The chart above hints that the markets are perhaps 3-10 days away from a turning. Longs may be able to squeeze a few more percentage points out of their positions but the risk of a reversal, and perhaps a significant one, will increase with each passing day. Breadth indicators are now giving neutral readings so no clues from them; however, $NYSI is struggling and while it hasn’t rolled over yet it could at any time. Money in the market is money at risk. Be careful especially over the course of these next few days. Posted in: General Market Thoughts. Tagged: $BDI, $COMPQ, $CRB, $NDX, $RVX, $SPX, $VIX, $VXD, $VXN, $VXO, Ceridian, IWM, IYR, QQQ, TNA, TQQQ, UPRO, Zweig Breadth Thrust. Tough to be bearish now. With the exception of the metals sectors, the $CRB index, TAN, LIT, and IYR, every other major index or key sector ETF that I track is now above its respective 50MA. In some cases, like the unstoppable QQQ’s, the 50MA has turned up. The ADX line is already turning up for the Q’s, $COMPQ, $SOX, and RTH and will most likely turn up for many others next week. Accoring to Martin Zweig, when ZBT falls below 40 and then rises above 61.5 within 10 sessions, it marks the beginning of a new bull market phase. On Monday, October 3rd, ZBT dropped to 38.81. On Friday, October 14th, the ninth session following the 38.81 reading, ZBT rose to 62.13. BTW, ZBT did not meet this requirement after the August/September lows of 2010. $VIX closed below 30 and very close to the low of the day on Friday, as did $VXN, $RVX, $VXO, and $VXD. $VIX also closed right above its lower Bollinger Band but did not tag the BB. Because the lower BB has turned south, $VIX is probably just going to crawl down it for a few days rather than bounce off of it, or famous last words. 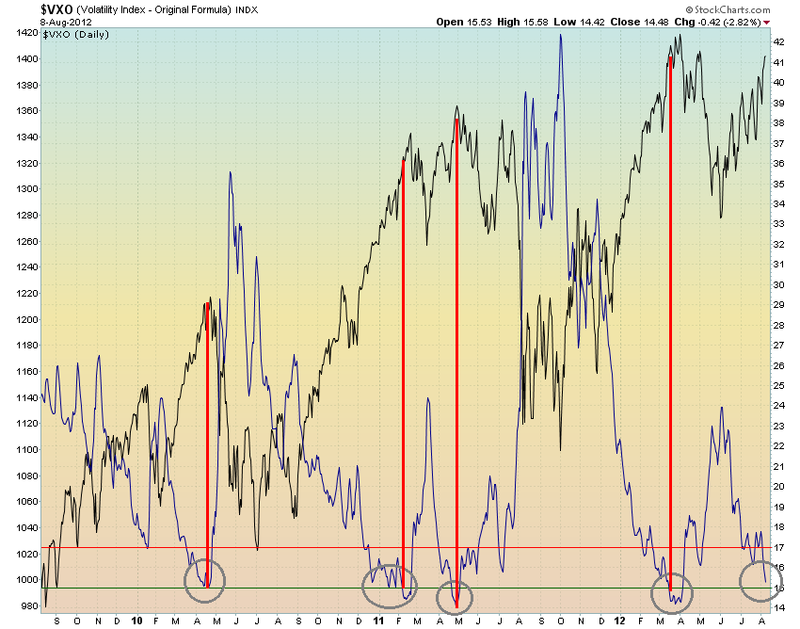 Regardless, volatility should back off for now and maybe until $VIX drops into the mid-teens. Ceridian’s latest report isn’t too rosy and it suggests that we’re on the brink of a negative GDP reading, but we’re not there yet. Meanwhile, $BDI has been moving up since late July and has gone positive for the year. This disconnect continues to puzzle me. I put up a chart Friday of the $SPX using Fib-based Bollinger Bands and a 250 EMA. You can see it by clicking on the Twitter box to your upper right. And if you’re a bear, you really need to take a look at it. $SPX rose 69 pts on the week and is now up 93pts and 8% for the month. Something like that has to get your attention. I don’t know if it’s expecting to much or if I’m sounding like a froth-mouthed bull, but it is possible for the $SPX to rise to the 1260 area next week, which would put it right there where the tie up between the 26 & 52 MA’s is. That’s not a target. Just sayin’. In late August of 2010, the RSI on the weekly chart of the $SPX rose back above 50 and the market rallied for eight months. Hmm. As a paranoid trader, I never take anything for granted but right now, and for the past two weeks, the market is indicating that it wants to go higher. SPX 1230 shouldn’t be too hard to overcome and the 1260 area is only about 3% away. I’m quite happy with the performance of the TNA that I bought on the 10th and I plan to begin scaling in with a little more of that and TQQQ. I will also be looking to add to my UPRO positions, which I’m underwater on now in two separate accounts. I’ve started a Lion fantasy portfolio and I’ll put up the link to it sometime later today or this weekend. Stay on your toes and keep looking over your shoulder.